Part One of processing the book Enough is here. 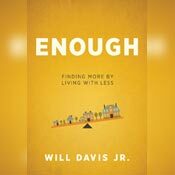 I read the book “Enough” by Will Davis Jr and wrote my review. I kinda thought that would be the end of it. Lesson learned – my More Than Enough, my Plenty, my Abundance can be or IS someone else’s Enough. Such a neat idea in theory, but what that means in a daily way didn’t fully sink in – not at all. That book is messing with me! I read in “Enough” that we are to be giving our ten percent to the church, but in reality for us we’re giving about five percent to our church and about one percent to other organizations. I cannot stop thinking about that principle that is all over scripture. What will it mean this month to give ten percent off the top, at the beginning before we pay our bills, and sort out how to live afterwards? These are things that we don’t really want to think about or do. I woke up this morning thinking about this again, that we’re instructed in scripture to give ten percent and we’re to trust God to provide for our daily manna. That means honestly taking a look at how we spend our money, where does it all go in a month? Many times for us it is frittered away on more video games, and frozen yoghurt, and iced coffees for the kids; on the conveniences of modern life, like dry cleaning and lawn care and mobile phones and eating out a few times. For me, on buying books and not requesting them from the library. What does it mean to take a cold hard look at our monthly spending and at the beginning give to God off of the top and then sort out the rest? The first thing I remember from the book is that Davis suggested we look about our home for all the things we haven’t used or worn in the last year. That job, to clear our home of these things so that they might possible become someone else’s Enough, is the task for this week. (Even though, I REALLY DON’T WANT TO DO IT! I’m so lazy.) We’re going to photograph all the things we don’t need and use, things that are just taking up space in our basement and garage, and give them away. The task just as it stands is a daunting one and today with the sun shining and a long empty day looming ahead, what I really want to do is hang out by the lake or something, anything but go through our stuff. But I think this act of obedience is the thing that needs to be accomplished, today. Davis spoke of slowing down, listening and being open to God speaking. Yesterday, I found out someone I know is sending their kid to a Shakespeare away camp. (It feels like everyone sends their kids to summer camp away, except us.) And another person is sending their kids to Grandma and Grandpa for the duration of the summer. When I heard that I felt envy and anger that we haven’t take our kids on a vacation in several years; although it is out of an act of obedience, where we decided we would never again live on credit. That was a baby step of financially growing up, that we took a few years ago. This means we don’t travel if we don’t have the cash the bank. Yes, I wish to be able to take the kids to visit Grandma and Grandpa, that but for now this is not possible. We have a child in college and we have many other obligations. As I woke this morning I was angry and to be honest kind of thought I was mad at God. Then I realized that we’re just being smart. We save for retirement, we live within our means, we give (like I said not ten percent yet) and we try to respond to needs as they come before us. Right now there is no margin for vacations. It’s not God that is to blame for an unsustainable American Dream. And if I feel angry that we don’t have Enough to go on a vacation with our kids this summer, I should focus that emotion toward clearing out of the house our More Than Enough so that others can be blessed. 2012: ABUNDANCEBE REALbuying booksEnoughPatheos Book ClubPatheos Book Club; "ENOUGH: Finding More By Living with Less" ; Will Davis Jr.taking up spacevacationWill Davis Jr.